When will this deed be signed? Will the grantor sign in Virginia? Do you want to modify the margins on your deed?Changing the margin width is only necessary if you need more space for recording stamps and notes. If you are unsure of the appropriate margins, you should contact the recorder's office for more information. If you do not modify the margins, the approximate below margins will be used. In general, you should not lower your margins to values lower than those listed below, doing so may result in the recorder's office rejecting your document. This form will default to a 1 inch margin at the top of the first page, with a 1 inch margin at the top of all other pages. The bottom margin will default to a 1 inch margin at the bottom of the last page, with a 1 inch margin at the bottom of all other pages. The left and right margins will default to a 1 inch margin on all pages. First page top margin:The below options represent commonly used margins. If you would like to use a margin not listed, please download your Quitclaim Deed to Microsoft Word where it is possible to customize the exact margins. 0" 1/2" 3/4" 1" 1 1/2" 2" 2 1/2" 3" 3 1/2" 4" 5" 6" 1"
1/2" 3/4" 1" 1 1/2" 2" 2 1/2" 3" 3 1/2" 1"
1/4" 1/2" 3/4" 1" 1 1/2" 2" 1"
Do I need to submit a cover sheet with the deed?Some circuit courts in Virginia require cover sheets, while others do not. Click here to determine whether the circuit court where you will be filing the deed requires a cover sheet. Next, select the circuit court. If your circuit court requires a cover sheet then a "VLRCS link" will appear, which will take you to the Virginia Land Record Cover Sheet - Generator©. The Grantor attests for the Grantee and the Grantee's heirs and assigns that at and until the ensealing of these presents, the Grantor is well seized of the above described premises, as a good and indefeasible estate in fee simple. WITNESS the hand and seal the day and year first hereinbefore written. I ____________________________, a Notary Public in and for the said County and State, hereby certify that ___________________, having signed this Quitclaim Deed, and being known to me (or whose identity has been proven on the basis of satisfactory evidence), acknowledged before me on this day that, being informed of the contents of the conveyance, the Grantor has executed this Quitclaim Deed voluntarily and with lawful authority. Given under my hand and seal, this 20th day of April, 2019. A Quitclaim Deed, also known as a non-warranty deed, is used to transfer property interest from one person (grantor) to another (grantee). Quitclaim Deed is sometimes misspelled as "quick claim deed". A Quitclaim Deed is often used between parties who know each other, such as family members or divorcing couples, as with a Quitclaim Deed there is no warranty to the property title. The title of a property refers to all the rights of property ownership, including the owner's ability to transfer or sell interest in the property, such as through a deed. What can I use a Quitclaim Deed for? What is the difference between a Quitclaim Deed and Warranty Deed? A Warranty Deed is used in most property sales, and makes a guarantee that the grantor owns clear and complete interest in the title and the property is free of all liens. Alternatively, a Quitclaim Deed does not include the warranty that the grantor owns full rights to the property. How do I fill out a Quitclaim Deed? The grantor is the party transferring his or her interest in the property title to another person. The grantee is the party receiving the interest in the property. Grantors and grantees can be individuals or corporations. Consideration is the price the grantee pays the grantor for the property interest. Listing an amount for consideration in the document is required to have a valid agreement. Even if the transfer is a gift, a small amount, such as $1-10, is often listed as consideration. A legal description of the property needs to be included in the Quitclaim Deed. This can be found on an old deed or at your local County Clerk or Registry Office. A parcel ID number will also need to be listed on your Quitclaim Deed in some cases. It can be found on past tax statements. To execute the Quitclaim Deed, the grantor needs to sign the deed in front of a notary public. Some states require witnesses to sign the deed in addition to a notary public. Once it has been signed, the Quitclaim Deed is filed in the local County Clerk or Registry Office and sent to the grantee after it has been recorded. Does a Quitclaim Deed remove me from the mortgage? Although a Quitclaim Deed removes a person's name from the property title along with removing their ownership rights, it does not eliminate that person's responsibility for the mortgage on the property. In other words, signing a Quitclaim Deed simply removes your name from the title, it does not absolve you from paying any debts you incurred as an owner of the property. 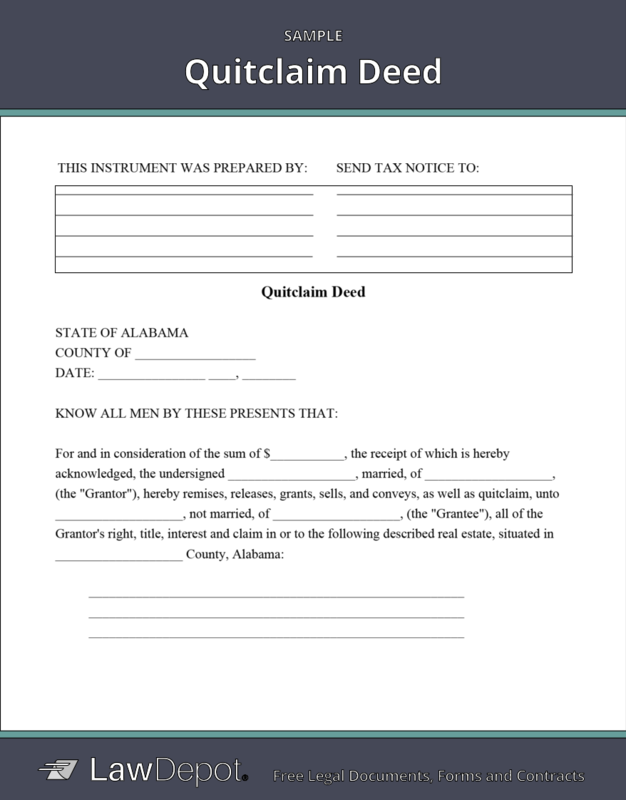 Personalize your Quitclaim Deed template.